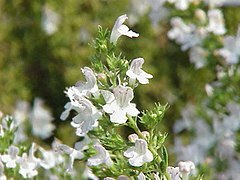 Satureja is a genus of aromatic plants of the family Lamiaceae, related to rosemary and thyme. There are about 30 species called savories, of which Summer Savory and Winter Savory are the most important in cultivation. Wikimedia Commons has media related to Satureja.